Living Lasagna - Vegans Eat What? Vegans Eat What? I must admit I was somewhat intimidated when I first saw this recipe. I thought it looked too involved and required knife skills I simply don’t possess. Happily, I was wrong! The recipe came together much faster than I expected and was definitely worth the effort! Marinated Veggies - Combine all and set aside in a bowl. Herb Ricotta Cheese - Blend till smooth. Adjust water for spreadable consistency. Set aside in a bowl and cover with damp cloth or paper towel. Mushroom Layer - Combine and set aside in a bowl. Tomato Sauce - Blend till smooth. Set aside in a bowl. Noodle Sheets - Cut on mandolin into wide, paper-thin slices. 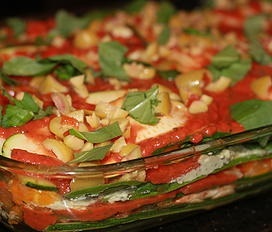 In a glass casserole dish, layer in the order below. Cover and refrigerate to set, 5+ hours. zucchini - ricotta - mushrooms - zucchini - tomato sauce - onions/peppers - zucchini – ricotta – spinach – mushrooms - onions/peppers - zucchini - tomato sauce. Garnish with chopped olives and basil leaves. This recipe is from Sarah Comerchero. Sarah's Notes: I haven’t met a vegetarian or omnivore who has not loved this recipe and is totally fascinated by it. It takes some prep time but with this big batch my fiancée and I can look forward to a delicious dinner all week long! It looks beautiful in presentation and gives an explosion of fresh, bright flavors. It’s so easy to modify to your taste preferences and once you make it a few times you can do it by heart.